Bad news today out of a federal court in Mexico. Duane "Dog the Bounty Hunter" Chapman has lost his appeal challenging extradition to Mexico to stand trial on charges of "deprivation of liberty" for his capture of Andrew Luster. In October, 28 members of Congress sent a letter to Secretary of State Condoleeza Rice asking her to block the extradition. Dog had offered an apology to Mexico, pay a fine, make a donation to charity and forfeit his bond money. That should have been enough. It's time to free Dog. And yes, he's a long-time pal. I got a call at 8:00 a.m. (MT) this morning from Fox News saying Andrew Luster had been arrested in Mexico, and the bounty hunter who had arrested him was also in jail. They were letting me know because I was scheduled to do a segment at 11:00 am (MT) on the Scott Peterson case, and they are adding Luster to the segment. 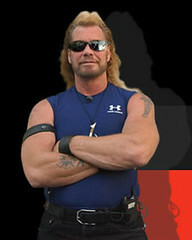 I took the news kind of personally, because Duane Chapman, or Dog the Bounty Hunter as he's usually called, is a bondsman I have used in the past and like a lot. After a few years of not being in touch (he moved to Hawaii and mostly lives there, although he still has his business in Denver) we hooked up again by coincidence a few weeks ago. As soon as I heard the news from Fox, I called his wife Beth in Hawaii who, understandably, was quite distraught. Not only did they arrest Dog, but they arrested her stepson, brother in law, a movie actor (who recently was in the film Italian Job), the camera man and the sound man. Some things to know about Dog: He never carries a gun. Mace, sometimes, no guns. He has a really interesting life story, which you can read here.